Quebec City July 19, 2015 · 16 min. readThis article may contain affiliate links. "First bombing of the city. At 9 p.m., at the moment of the final blessing of the church, the English begin firing their cannons and bombarding the city using five mortars and four large cannons. The mortars and cannons were fired for about twenty-five minutes, around every twenty-five minutes until noon on the thirteenth without interruption. The attack filled the city with terror, and in fact considerably damaged several homes and churches, especially the Cathedral, the Jesuits and the Congregation. Our rectory was breached by two 32-lb cannon balls. "Before the siege, we had retrieved from the church the four tabernacles, two statues of the Blessed Virgin and of St. Louis, the high alter, two small paintings, four reliquaries, four beautiful crystal crosses that were in the sanctuary, the altar frontals and all the ornaments, silverware and linens. "All the rest was burned." As I stood on the balcony above Notre Dame Cathedral in Quebec City, I had a hard time fathoming the horror the city once experienced. Pictures show the devastation the building was in when the siege concluded. The cathedral was destroyed, with its columns scorched, the pews turned to ash, and the roof obliterated. It would take years to rebuild. 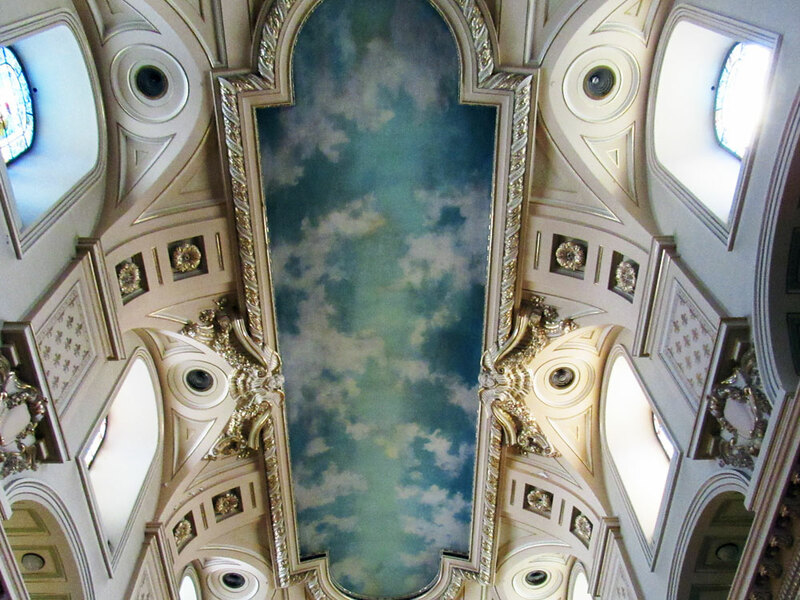 The destruction of this church – the first Catholic parish north of Mexico – and the defeat of Quebec a month later would fragment New France, an area spanning Hudson's Bay to the Gulf of Florida. This war would change history, and transform North America into a British colony. 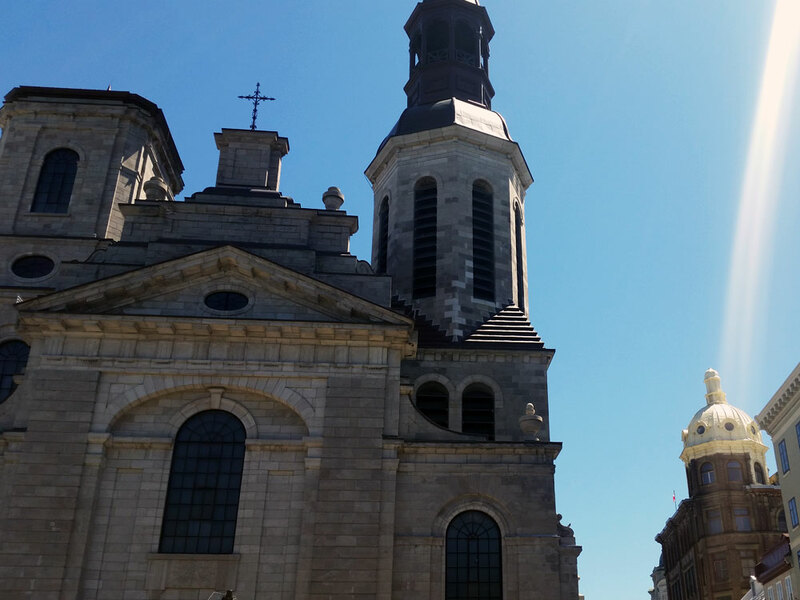 Today, the cathedral stands in the heart of Quebec, a UNESCO Heritage Site. The roofs, windows, floors and walls have all been restored, and a south bell tower has been added. Work began on a north bell tower, but it was discovered the ground below it was too soft to support the weight, and the project was scrapped. Another project is currently underway to open the bell tower to the public, but as the stairwell was last built using 1920s safety measures, it isn't considered safe to climb. The cathedral isn't only a house of prayer, but also a house of remembering. The north gallery is home to a museum dedicated to the priests that worked in the church, along with their stunning cassocks, silver goblets and relics. The south gallery contains papers written in Latin, a miniature Ark of the Covenant, and artwork reproductions based on the originals that were stolen and damaged by their captor. The cathedral also houses a crypt. This crypt contains over a thousand bodies, with some belonging to the victims of epidemics that ripped through the city, others belonging to the victims of war, and some of priests, bishops and archbishops laid to rest in their own personal tombs. Cameras are forbidden as the crypt is still in use. With much of Quebec falling under the same UNESCO World Heritage status as the cathedral, the city embodies this sense of historic remembrance as well. Surrounded by fortified walls, and laced with cobblestone streets, Quebec stands out like none other. Being over 400 years old, and passing through the hands of three different countries, Quebec is a symbol of the past, a reminder of a bloodier time, and one that shaped our modern world. 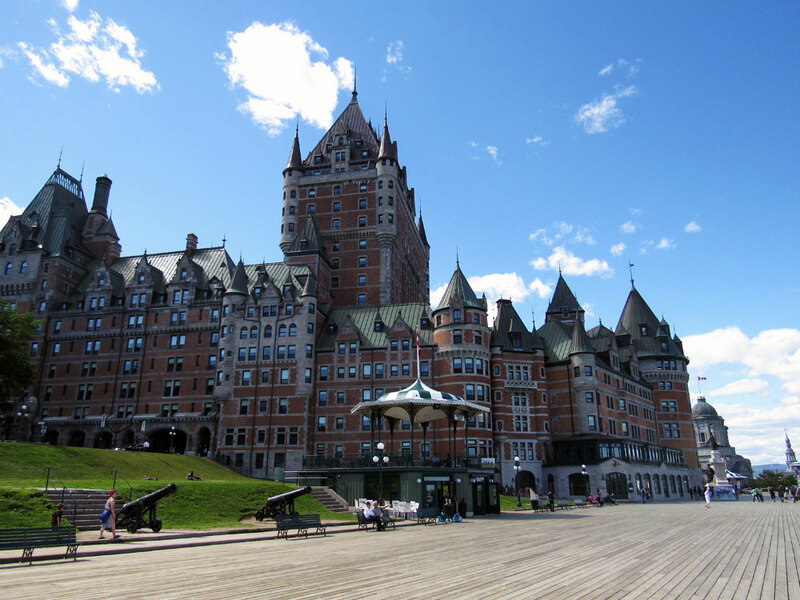 Just south of Notre Dame Cathedral is the picturesque Fairmont Le Château Frontenac. This hotel was built to rival any hotel in Europe, and has since a became a national icon. It also has the title of being the "most photographed hotel in the world". This hotel was built in 1893 by the Canadian Pacific Railway and was part of a project to create extravagant, luxury hotels across Canada. Surrounding Château Frontenac is a large wooden terrace, extending over the winding streets of Lower Town. Filled with hand-holding couples, street performers and laughing children, the terrace offers a relaxing atmosphere as well as a fantastic view of the city and the St. Lawrence River. Peaking up through the terrace are a series glass "icebergs" that show a dark room below. The icebergs are actually skylights to the St. Louis Fort and Châteaux Historic Site, a new museum in Quebec City. The museum is built on the ruins of the Chateau St. Louis, the official residence of the French Governor of New France, the British Governor of Quebec, the Governor-General of British North America, and the Lieutenant-Governor of Lower Canada. The museum shows the growth of the residence from its modest, single-story size up into a massive four-story building. Much like Notre Dame Cathedral, and the rest of Quebec, this building was extremely damaged by the Siege of Quebec in 1759. 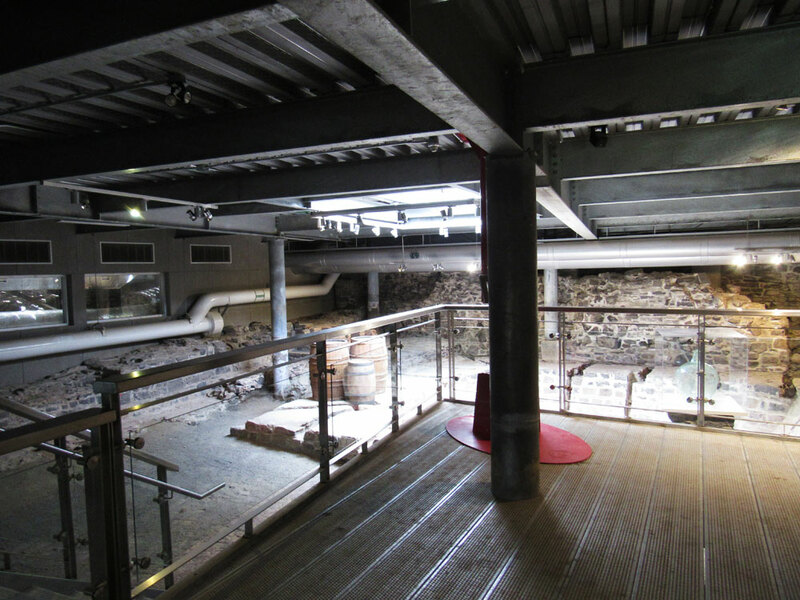 The building would be destroyed by a fire in 1834, and would be covered up and forgotten. A century and a half later an archaeological project would begin to uncover the old building, and original artifacts from the bygone era were recovered. This included things such as plates, cups, hair pins, buttons and wax seals. 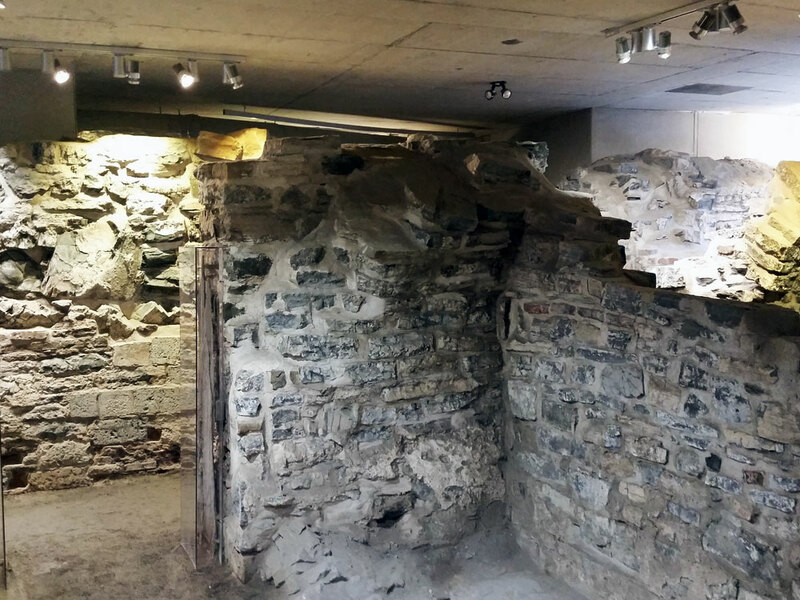 Sections of the building also showed how the people lived and worked, including the "refrigerator room" which had a massive indentation in the ground where people would put ice sawed out of the St. Lawrence to keep food throughout the year. Other rooms were kitchens, dining rooms, garbage pits and bathrooms. South of the Château Frontenac is another museum, this one built for a similar purpose of political control: the defence and implementation of war. 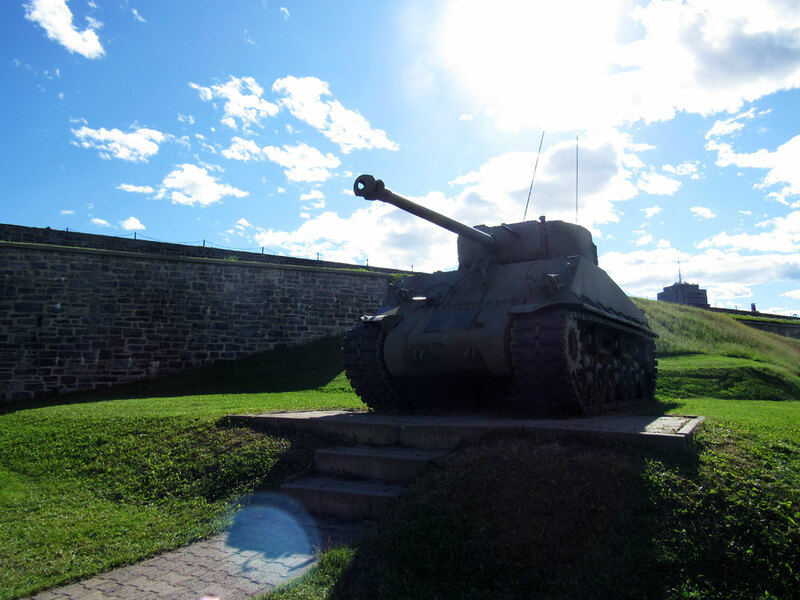 Camouflaged in the Plains of Abraham, the Citadel is an active military base of the Royal 22nd Regiment. Constructed in the shape of a star, the Citadel was built for the purpose of fighting the invading British, but wasn't completed in time. Instead, the British completed it to protect the city from the invading Americans. Invisible by land or sea invaders, the Citadel is lined with cannons pointing towards the shore. 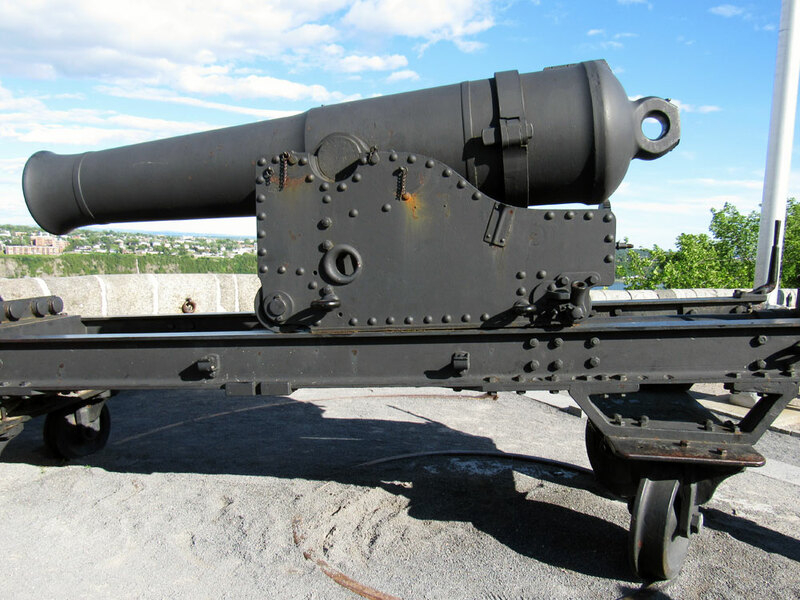 The largest cannon, Rachel, points out to the St. Lawrence River towards Quebec's neighbouring city of Levis. During the 19th Century, a test was conducted in the winter to see if Rachel still worked. The test was to fire Rachel out into the St. Lawrence River where the cannonball would either crash into the ice and stick, or fall safely through the ice into the river below. The cannon was fired, the ball soared, and it hit the ice. However, the ball bounced off the ice and flew into Levis, crashing into a building and destroying it. Since then, no more tests have been conducted at the Citadel. 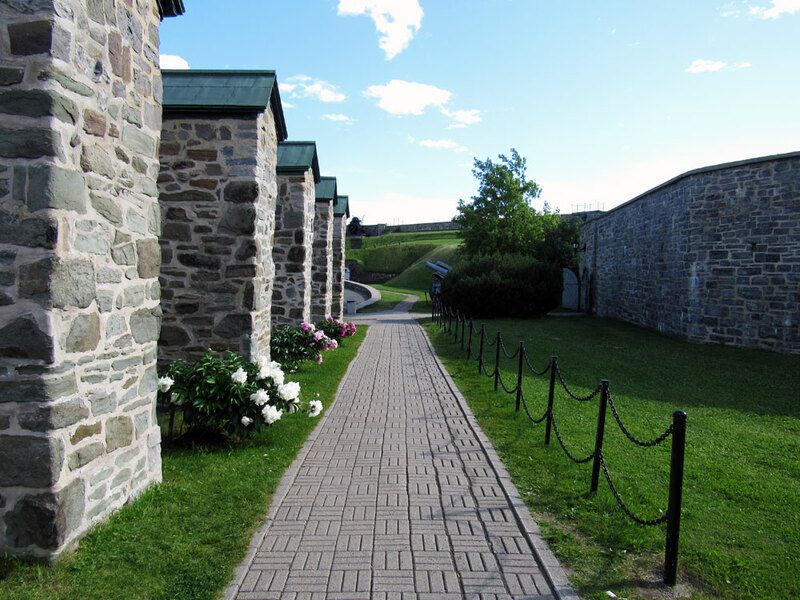 Unlike its twin in Halifax which only contains one building, this citadel contains over a dozen, including the barracks, a mess hall, an old jail, a former powder magazine and a church. These buildings show the different architectural designs of the British and French, with the French buildings having mosaic-like masonary and green roofs, while the British have square bricks and grey roofs. The Royal 22nd Regiment is also noteworthy. Established during the War of 1812 by the British to defend Canada, the regiment would remain English for over a century until World War I broke out in Europe. The regiment took part in every major conflict in Europe, including the battle of Vimy Ridge, the battle that defined Canada to the rest of the world. Once the war was over, the 22nd Regiment broke apart. Public and international pressure brought it back together, and it was redeployed to Europe in World War II. The Royal 22nd Regiment would in turn become the first Francophone unit to mount the King's Guard in London. This prompted King George VI to address the regiment in French, being the first time in history any royal member in British monarchy spoke French to the men defending their country. The regiment would later join the battlefield and would be involved in conflicts in Italy, the Netherlands and northwest Germany. They would see actions in other wars as well, such as the Korean War and would be stationed in West Germany during the Cold War. The Plains of Abraham surrounding the Citadel and extending southwest is where North America's fate was decided. It was here the British attacked Quebec City during the night, in a battle that would last between 15 minutes to half an hour (depending who you ask) killing the leaders of both militaries. Although Quebec consequently fell under British control, it didn't stop another battle from breaking out in 1760 between the French and British, this time with the French military being victorious. Quebec would see war 15 years later after the Americans had captured Montreal. Winter conditions delayed the attack on Quebec City, and although the Americans were outnumbered three to one, they continued through with their assault. In 1776 nine thousand British reinforcements arrived, and the Americans were forced back to their own country. Similar events would unfold in 1812 when the Americans tried to invade again, but due to inexperienced soldiers the attack was delayed. Canadian forces, backed by Aboriginal tribes, fought against the Americans until 1813 when a flood of veteran British reinforcements arrived, fresh from the Napoleonic Wars. This concluded with Canadian-British forces burning down the Whitehouse in Washington D.C., and the creation of the 22nd Regiment. 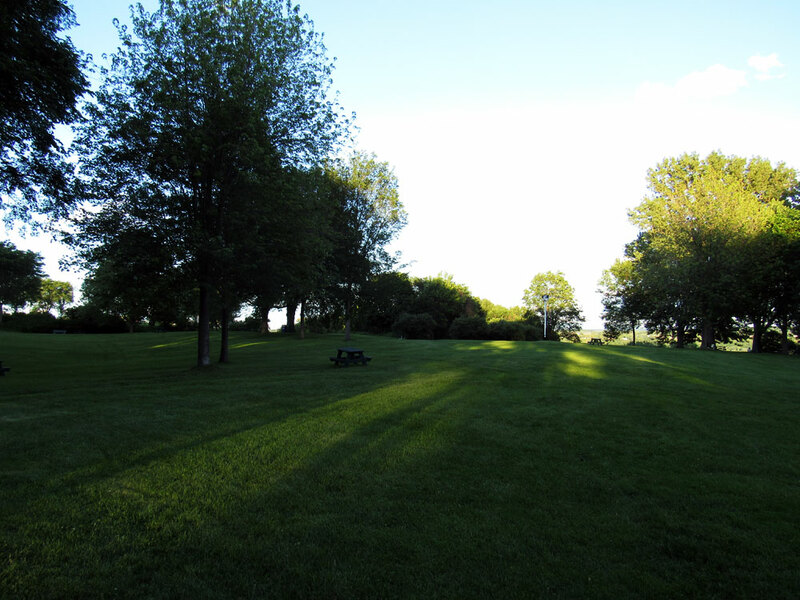 Today, the Plains of Abraham have many relics to remember these battles, and the defensive measures the city constructed to thwart capture. 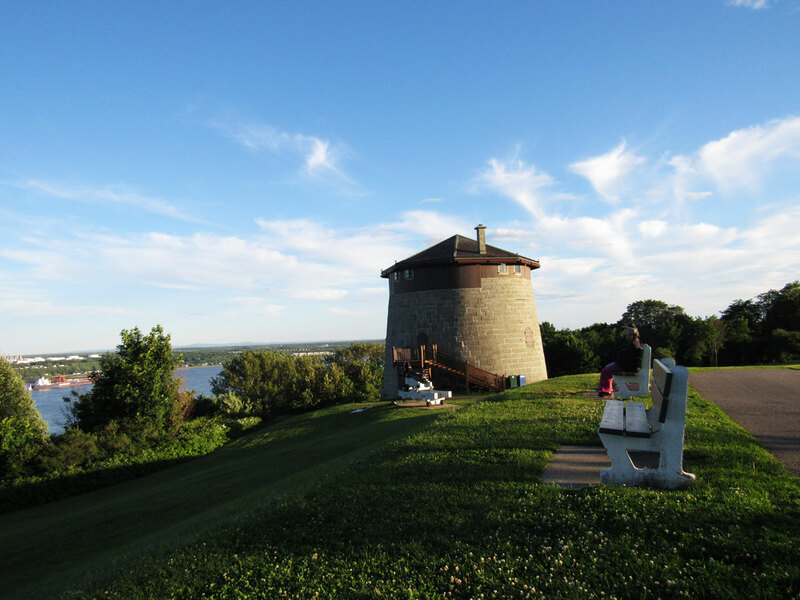 Thirteen "Martello towers" were built in Canada by the British, with nine remaining. Of these nine, three are in Quebec City. Tower 1 is a museum, sitting on the edge of the Plains of Abraham, the nearby Tower 2 holds the "1812 Murder Mystery Dinner", Tower 3 was destroyed in the 20th Century but was used as a residence, and Tower 4 is in the north side of the city. With war defining Quebec's history, death was prominent as well. 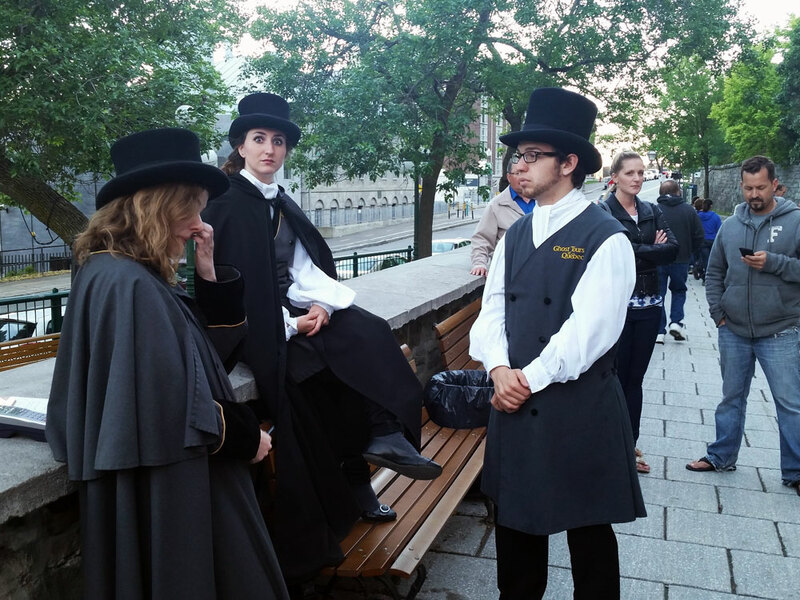 Quebec City holds a plethora of nightly ghost tours that take people around the city where they can hear about various paranormal events. One such event involved a witch named Marie-Josephte Corriveau. She was convicted of murdering her two husbands, claiming they got in the way of her witchcraft. After she was executed in 1763, her body was put on display in a cage in Levis. As legend has it, screams could be heard coming out of the cage every night, keeping citizens awake. It became so unbearable that the cage was eventually buried. It was uncovered in 1849 but was immediately stolen and put on display in a museum in Boston. According to reports within just 3 weeks of the cage's arrival the museum caught fire and the cage went missing. It was later recovered fifteen miles away in Salem, a city infamous for its witches. The cage was returned to Levis but within just weeks of its arrival two more subsequent fires broke out, and it was sent back to Salem, where it remains to this day. As for Marie, however, some say she haunts the woods around Levis, and continues to scream well into the night. Other stories tell of the curse that brought down the Empress of Ireland in 1914, a ghostly woman in black that haunts the balconies of the Holy Trinity Cathedral witnessed even by Queen Elizabeth II, and the hauntings of a neighbourhood that once housed the cemetery of smallpox victims, with several reports of red eyes from the shadows possessing people and forcing them to commit murder. Today, Quebec is a thriving city of a half million people. Much smaller than Montreal, Quebec has been able to retain its European feel thanks to its UNESCO Heritage status. Although I was told Quebec would be very anti-Anglophone, I found the opposite. In fact, Quebec embraces both its French, English and Canadian heritage. Gone are the days of war, destruction and separation. Instead Quebec is now a pinnacle of peace, creation and unity. 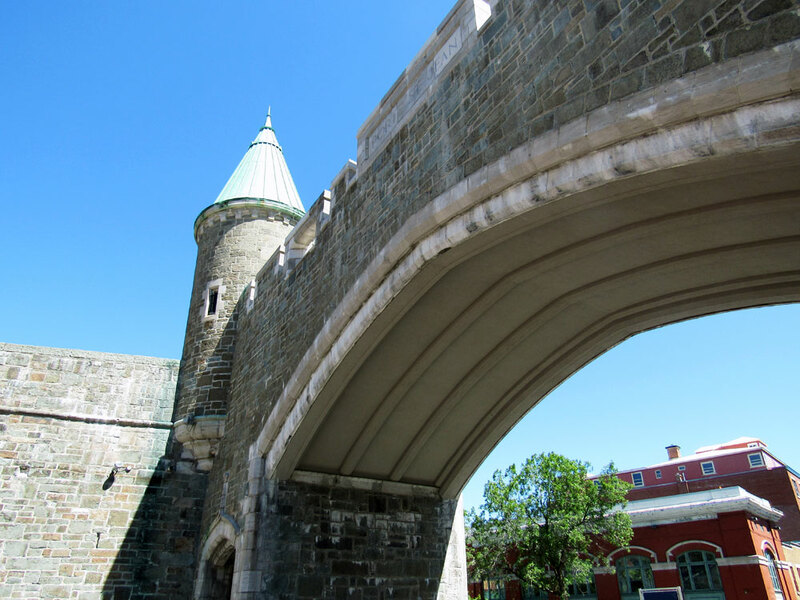 Through the delicate preservation of history, Quebec offers visitors a step back in time to a different era, with different enemies, different ideas and different customs; an era that would help shape the very fabric of North America, and one that we can all be thankful for.